Gas Cylinder Cabinets are designed to provide a safe and cost effective means to isolate hazardous gas cylinders from the surrounding workplace. The cabinet exhaust vent is designed to be coupled with a fan (not supplied) to provide a "local" exhaust gas control system to maximize operator safety when working with hazardous gases. These cabinets also protect cylinders and delivery systems from accidental contact, unauthorized handling and tampering. 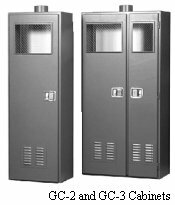 The GC Series Cabinets are available in single to four cylinder configurations and feature a removable back panel inside the cabinet that is used for mounting regulators, valves, and other components of the gas delivery system. Windows permit visual inspection and access into cabinet for adjustments while minimizing operator exposure to potential toxic leaks. Water sprinkler heads on the ceiling provide for extra fire protection, while adjustable cylinder brackets secure cylinders from falling in the event of a fire or earthquake. All Welded Construction using 11-gauge steel (exceeds code requirements) provides for extra structural strength. Epoxy Painted Texture Finish on outside and smooth finish on inside enhances cabinet appearance. Louvered Panel on base of door(s) provides maximum coverage of air flow through cabinet. Removable White Back Panel on inside rear of cabinet can be used to mount the gas delivery system. Adjustable Cylinder Bracket(s) with Chain(s) accommodate a large range of cylinder sizes and secures cylinders from toppling. Door(s) and Access Window(s) Close and Latch Automatically preventing them from being accidentally left open. Adjustable Perforated Shelves accommodate smaller sized gas cylinders. Air Intake Filter allows for process protection by minimizing contamination from ambient air impurities. Custom Cabinets and Colors are available to match users needs. Fusible Link Fire Dampers automatically close air intake grill should a fire occur. Optional Adjustable Shelf Dimensions: 11" x 11"
Note: Custom cabinet sizes and colors are available.